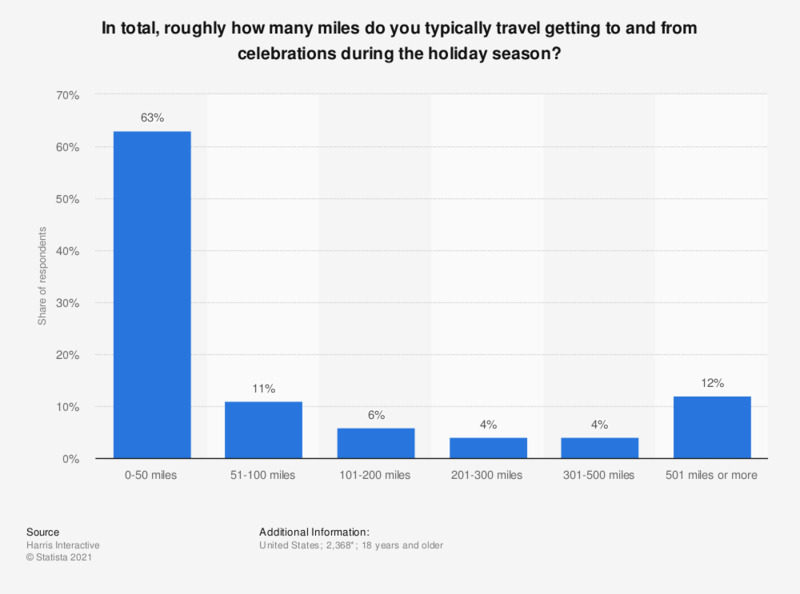 This statistic shows the results of a survey conducted in 2015 among adult Americans on how far they travel getting to and from celebrations during holiday season. 63 percent of respondents stated they travel 0 to 50 miles to get to and from holiday celebrations. *According to the source, this survey "was conducted online within the United States between September 9 and 17, 2015 among 2,368 adults (aged 18 and over). Additionally, oversamples were collected in English and Spanish among 511 Hispanic (representing Spanish-dominant, English-dominant and Bilingual profiles) respondents and in English among 179 Asian respondents."